The winner of the car will be chosen May 9th at our 30th Anniversary Party. Details to follow. Are you going to the Mikuni 30th Anniversary Party in May? Click Here for more information on the party of the year! Disclosure. The following is a summary of the Official Rules of the Mikuni 30th Anniversary Car Giveaway and is qualified in its entirety to the Official Rules which may be obtained at any of the Mikuni restaurant locations or on our website www.mikunisushi.com. Each applicant who enters the Mikuni 30th Anniversary Car Giveaway (“Giveaway”) will be deemed a Participant subject to restrictions. During the months of January, February, March, and April and May of 2017, Mikuni shall select one Participant to become a Finalist. Subject to the restrictions below, Mikuni will select one Finalist each month from submitted entries. Once you have been selected as a Finalist, you are no longer eligible to become another Finalist. You must be a California resident and a 21 year old, both on the date you submit your entry to participate, and on the date of the Giveaway event. Mikuni affiliates, sponsors, principals and employees, and their immediate family members (father, mother, children and siblings), are not eligible to participate. The Giveaway is void where prohibited by law. You may enter the Giveaway by completing an online application at www.mikunisushi.com/contests. 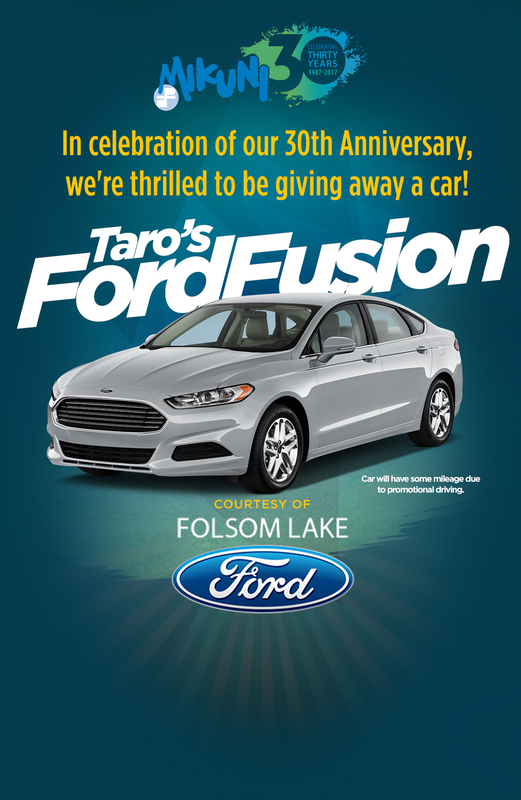 Or, an application may be obtained at any one of our restaurant locations and mailed to Mikuni corporate offices: Mikuni 30th Anniversary Car Giveaway, 5012 Luce Avenue, Suite 100, McClellan CA 95652. You may submit an entry once every four weeks. The entry period will begin on January 16th, 2017, and end on May 5, 2017. All entries must be received by 10:00 P.M., Sacramento Time, on May 5, 2017. The Giveaway event will be held on May 9, 2017, at McClellan Event Center at 5411 Luce Avenue, McClellan Park, CA 95652. In the event that a Finalist cannot attend, no substitute for such Finalist will be allowed. Each Finalist must sign an Affidavit of Eligibility within 5 days of selection or we will select an alternate Finalist. Acceptance of becoming a Finalist constitutes permission to use the Finalist’s name and photograph in website promotions, and for other promotional purposes, unless prohibited by law. There will be five Finalists. At the event, each Finalist will be given a key. Only one key will operate the car. All Finalists are responsible for other charges associated with taking possession of the car or any other prize. There is only one car that will be given away. The odds of becoming a Finalist and obtaining the winning key to operate and win the car depend on the number of eligible entries. Up and until the Giveaway, the car will be utilized for promotional purposes and, therefore, subject to mileage usage. Contact: Mikuni Restaurant Group, Inc.; 5012 Luce Avenue, Suite 100, McClellan, CA 95652.